We are a proud buncha yinzers here at Golden Triangle Bike Rental….and we are celebrating 11 years of helping riders Explore Pittsburgh and The Great Allegheny Passage by Bike. We are a small family, related by blood and our love of bikes, who want to help you have an adventure that you will never forget. By combining our guided and self-guided tour options with awesome bikes, world class trails, and an incredible city we promise to give the best experience. Whether you are taking a lunch hour loop through the Southside, or an 8 day journey to DC, we have you covered. 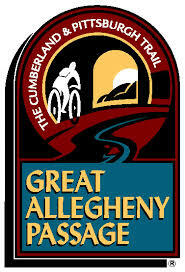 Golden Triangle is an Official Visit Pittsburgh Welcome Center, a hub for Pittsburgh cycling activity and highly recommended by the thousands of good people that have Explored Pittsburgh and The Great Allegheny Passage by Bike! Before you hit the trail, we want to make sure you’re prepared. Check out our Frequently Asked Questions, and if you still have questions or concerns, please don’t hesitate to stop into our shop or give us a call. One of our great team members will be happy to help! Our address is 600 First Avenue, Pittsburgh, PA 15219. We are located directly under the First Avenue “T” Station. Ride the “T” from any of the convenient locations throughout the city and the South Hills. The 3 best choices for parking are: 1st Avenue Garage, 2nd Avenue Lot, and street parking. Parking at the First Avenue Garage is $5 on weekends and evenings! We are located directly outside of the back stairwell of the garage, definitely making it the most convenient place to park! What kind of deposit do I need to rent a bike? You will need a valid ID and Credit Card. I am not familiar with Pittsburgh, do your provide a map? Yes, our Self-Guided-Tour Map will lead you on the bike trails and to all of the points of interest along the way. Our knowledgeable staff will be happy to take the time to go over the map with you and plan a route that is best suited for your needs. With more than 20 miles of traffic-free bike paths, Pittsburgh trails offer spectacular views of the three rivers and the beautiful cityscape. For a more complete ride, there are areas where use of sidewalks are necessary to go from one section of the trail to another. Do you offer bike tours? We sure do! We offer a variety of public and private tours. Check out the tour page on our site for more details. We recommend that you wear seasonally appropriate, comfortable clothing, not too loose, and closed-toe shoes. Don’t forget your camera! What type of bikes and equipment do you rent? For adults, we offer comfort hybrids, hybrids, performance hybrids, road bikes, mountain bikes and tandems. We offer bikes to accommodate children of most ages and sizes, although we do not offer training wheels. Adult bikes: We have comfort hybrids, hybrids, performance hybrids, road bikes, mountain bikes, and tandems. Child bikes: We have child bikes to accommodate most ages and sizes. We do not have any child bikes with training wheels. We have tag-a-longs and child trailers for kids who are not old enough to ride their own bikes. We have no options for children under 18 months and do not rent child seats (the seat that sits above the back wheel of an adult bike). Yes we do, and Pennsylvania Law requires that all customers age 12 and under wear a helmet. Helmets and locks are free with the rental. Yes, we can do most repairs and offer tune-ups and flat repair services. Do you sell your bikes? Yes, we hold an end-of-season sale each Fall. Check back for updates on our Used Bike and Gear Sale! Yes, we offer a 15% discount for groups of 10 or more. Do I need to make a reservation? And what is your cancellation policy? We always welcome walk-ins, but to ensure bike availability we recommend reservations at least 24 hours in advance. There is a $12 fee for cancellations, but no fee to reschedule. Click here to make a reservation! Daily Rentals and Reservations: Golden Triangle Bike Rental assumes no responsibility for weather. Reservations can be rescheduled before 11am at no additional charge. Refunds will not be given for cancellations, unless GTBR closes due to extreme weather, in which case money will be refunded in full. Tours: If the weather proves to be dangerous to our customers, tours will be cancelled and customers will receive a full refund. All refund decisions are at the sole discretion of Golden Triangle Bike Rental. We welcome all ages but customers under the age of 18 must have a parent or legal guardian sign our liability waiver. Children also must be 18 months or older and able to wear a helmet to ride in our child trailers. Here is our 2014 waiver. Check it out!